When it comes time to get your filing done in the office, having a label maker can make the job a whole lot easier. Furthermore, having labels that are available in a range of colors and sizes could sure help you become much more efficient and organized. With a Dymo LabelManager, organizing the office is a breeze. Depending on which model you use, a LabelManager enables you to print durable labels in sizes range from 1/4" to 1" wide, and you can print short labels or really long labels - the label length is determined by just how much you want to print on the label. 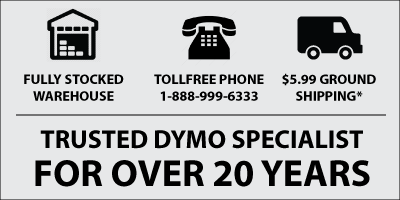 LabelManager printers use the Dymo D1 label tape system. The D1 cartridges are available in 1/4" (6mm), 3/8" (9mm), 1/2" (12mm), 3/4" (19mm) and 1" (24mm). Depending on the size of the label, they are available in up to 12 different color combinations, ranging from the most popular 'black print on white label' to 'blue print on clear label'.... and a whole lot of others in between. When we're talking about filing, D1 labels are perfect for labelling file folders, whether it be just printing a name or whether you want to start colour-coding your office. And once you've labelled the file folders, you can label the filing cabinet divider tabs, the filing cabinet name plates, filing shelves.... there's no end to what you can label.